Did you ever wonder how to differentiate a grade III tumor from a grade I? or how to tell a macrophage from a mast cell? To assist you with these and other perplexing questions, HCRI is pleased to introduce our Pathologist-in-Residence, Dr. William (Bill) Kaliney. Recently retired after 36 years at the South Bend Medical Foundation (currently The Medical Foundation), Dr. Kaliney will set up shop with his two-headed microscope in Harper Hall to review slides with you, answer questions, and help to design and interpret tissue-based experiments. Dr. Kaliney was born and raised in Ohio and obtained a double Bachelor of Arts in Chemistry and Physics from Miami University of Ohio. Then he achieved an MD degree at Northwestern University Medical School and Internship, Residency, and Fellowship at Case Western Reserve University School of Medicine in both Anatomic and Clinical Pathology. His Fellowship specialty was Surgical Pathology with subspecialty training in Neuropathology. His clinical areas of interest in Anatomic Pathology include tumors of the central nervous system, bone, breast, female genital tract and endocrine organs. In the Clinical Pathology arena, he has expertise in hematopathology, immunology (including flow cytometry) and clinical chemistry. 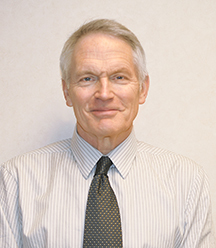 In addition to his clinical practice, Dr. Kaliney served as Director of Immunology and Flow Cytometry (1979-2015) and Executive Vice President of the South Bend Medical Foundation (2007-2014). Dr. Kaliney is also a dedicated teacher and previously served as Co-Director of Pathology Residency Training (1979-1990) and participated in the Pathology course at Indiana University School of Medicine – South Bend (1981-1998). Dr. Kaliney will be in residence in A231 Harper Hall on the second Thursday of each month from 1:00 – 4:00 pm, beginning February 11, 2016. To schedule time with Dr. Kaliney, please contact Laura Tarwater (tarwater.1@nd.edu; 1-2562) in the Tissue Biorepository. Originally published by Jenna Bilinski at harpercancer.nd.edu on January 14, 2016.